We brought all our hurlers to the Geraldine O’harrahan GAA grounds today to put on a hurling exhibition for the rest of the school. The aim was to allow the pupils who hurl an opportunity to show off their skills to their teachers and their class mates and hopefully to encourage a few more pupils to take up the sport. 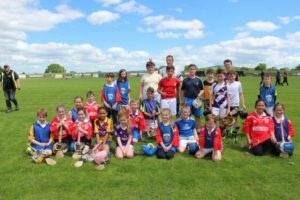 The local club has linked with the local schools with an aim to increase involvement at underage level.